Combine flour, baking soda, cinnamon, salt, nutmeg and ginger in a medium bowl; set aside. Combine sugar, brown sugar, buttemilk, vegetable oil, eggs and vanilla in a large bow. Add flour mixture and remaining ingredients. Stir just until blended. Grease 3 – 8 to 9 inch round cake pans. Divide batter evenly between prepared pans. Bake at 350 degrees for 30 -40 minutes or until lightly browned and firm to the touch. Cool for 10 minutes in pan, then remove pans and let cool completely on wire racks. Prepare icing as directed. Frost. Cover and refrigerate cake. Combine butter and cream cheese in bowl. Add sugar and vanilla. Beat until very light and fluffy. 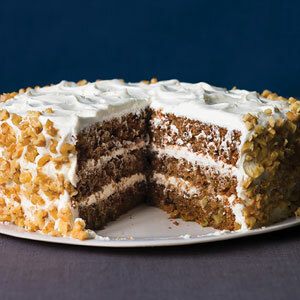 Frost cooled cake layers. Garnish with additional chopped nuts if desired. Delicious!!!!! Note: This recipe was given to me by Linda Stubbs of Sterling, Kansas at least 25 years ago! It has become a family favorite. The buttermilk just adds great texture and flavor. Thanks for sharing Linda! Featured in our “Between Friends” Cookbook. Thank you for posting this recipe! I have a very old catalogue of sorts from Linda that featured a few recipes and they have become my family’s favorites. I’m always happy to have another of her recipes!